A person plans to go on a vacation to relax, rejuvenate and enjoy some quality time with his family, friends or beloved. He seek peace of mind and complete comfort while booking a hotel lodging at the destination he wishes to visit on holiday. To deliver the desired hospitality and comfort to guests is the most important thing. It is not very often easy to deliver all that a guest demands on his holiday at your hotel. 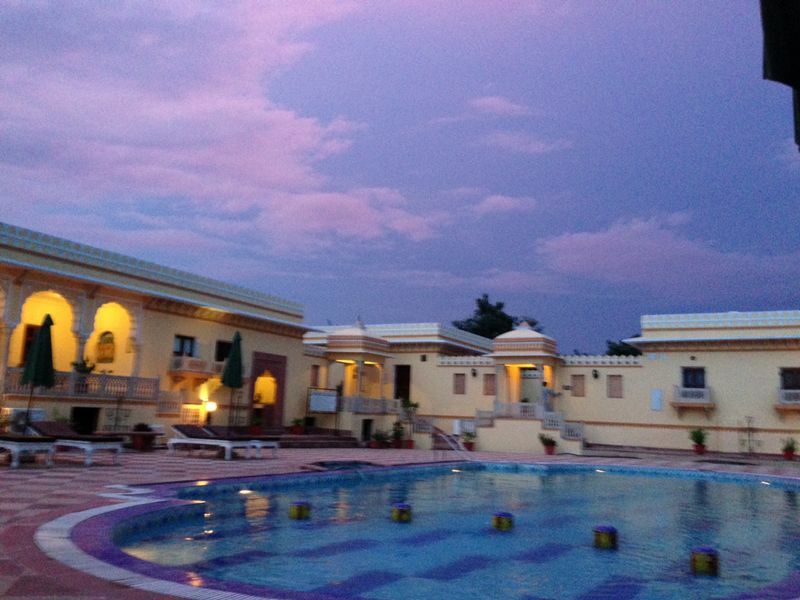 But, at Amar Mahal, Orchha our prime focus is to satisfy our guests with excellent hospitality and supreme comfort. And when your efforts are paid off you are motivated to walk on the same path of delivering excellence in your hospitality. 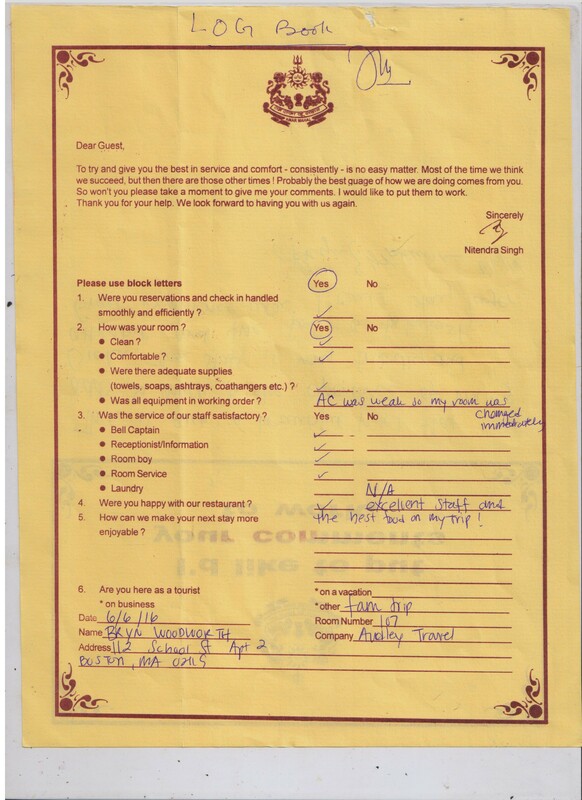 Here we are sharing with you the reviews of our guests who left delighted by Amar Mahal Orchha’s property and hospitality offered to them by our staff. 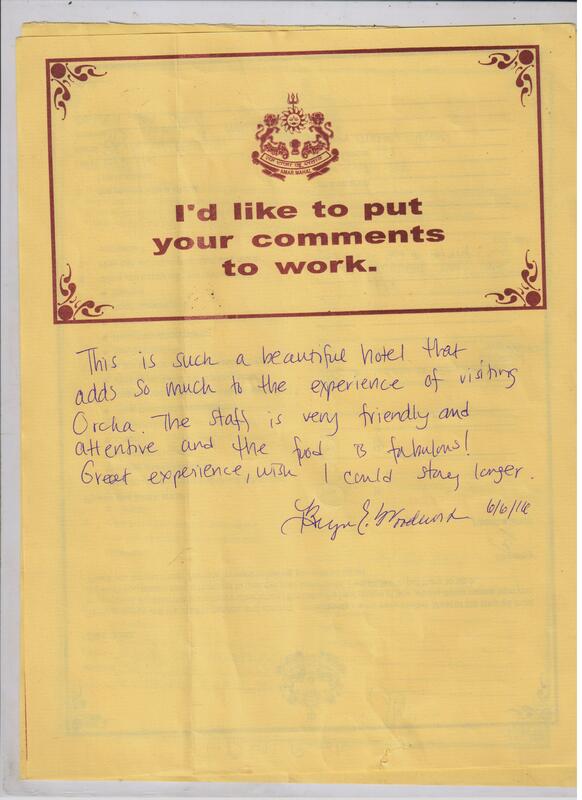 We are happy to receive such rejoicing and motivating feedback from our guests at Amar Mahal, ‪#‎Orchha‬. Amar Mahal Orchha is a medieval palace, which still stands high depicting the tales of bygone era. It once witnessed the grand royal stories. The present retreat is an addition to the old world charm that dates back to 1895.It is a perfect gateway to experience the historical and natural splendor of Orchha which are less than a kilometer away from the hotel. We personally supervise the preparation for our extensive Menu, offering the true flavours of the continental and local Bundelkhandi dishes prepared from the fresh plucks of our own organic garden. Dinning at Amar Mahal is a unique experience that not just brings back to life the grandeur and memorable flavors of the royal era but also serves health in the platter. A visit to Amar Mahal is like a tryst with history. Have you ever pondered about an evening hour sitting by the pool and sipping your glass of premium wine? Titillating, isn’t it? Oh well you can enjoy that “me time” if you wish to. After all you work hard all the week days and you do deserve a perk of weekend for yourself. 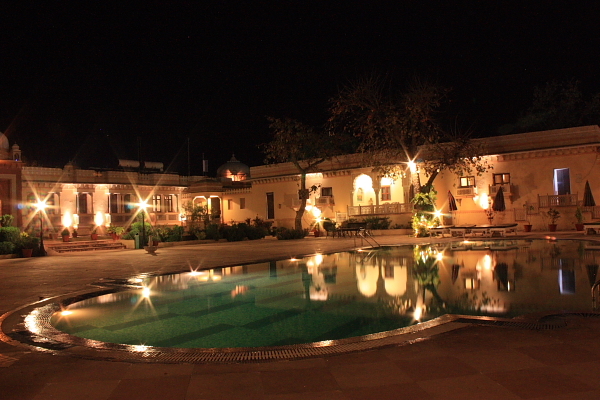 So just hit the road and reach out to the far more laid back and hassle free ambience in the air of Orchha. Certainly a trip to this mesmeric hidden land makes for a rewarding and relaxing weekend amid serene surroundings. Just release all your stress and just relax at this peaceful, hidden land. The calm and tranquil pool lit with tranquil lights in the evening will help you seek respite from the summer heat on your sedative vacation at the peaceful Amar Mahal, Orchha! Get pampered by delightful services and plush amenities at your service by the plush swimming pool or within the comfort of well appointed rooms. An ambience to help you smoothly sail into the happier times of life! Now, it’s all about you, you need to make a decision to be here!